This afternoon I had an urge to make some cookies. I looked in the pantry to see what I had on hand, and I came up with the most delicious recipe. 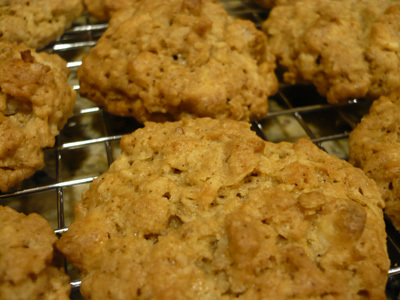 The base recipe is Quaker’s Vanishing Oatmeal Raisin Cookies, but instead of raisins, I added coconut and white chocolate chips. I also cooked the cookies longer to get a much more crispy cookie. These were a hit! Cream the butter with the brown and white sugars in an electric mixer. Add the eggs and vanilla and combine. Add flour, baking soda, cinnamon, and salt and mix well. Add the oats, coconut, and white chocolate, and combine. Drop dough by rounded teaspoons onto an ungreased cookie sheet. Bake for 17-20 minutes, until golden brown. Cool one minute on cookie sheet and then remove cookies and let cool completely on a wire cooling rack. Store in an airtight container. I love to cook, but cookies are definitely -s’s domain! The original source of this recipe I believe is Betty Crocker. Over the years -s has changed it up a bit, primarily the amount and type of chocolate. These cookies are just to die for! Mix sugars, butter, shortening, egg, and vanilla. Stir in remaining ingredients. Drop dough by rounded teaspoonfuls about 2 inches apart onto ungreased cookie sheet. Bake until light brown, 8 to 10 minutes. Cool slightly before removing from cookie sheet. 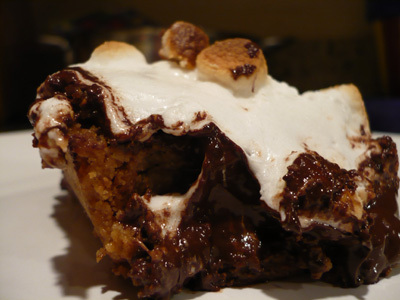 I found this recipe on the Closet Cooking food blog. Since I live orange and chocolate together I knew I had to give these a try, and they didn’t disappoint. Melt the butter and one Maya Gold chocolate bar in a sauce pan and remove from heat and let cool. Chunk the remaining chocolate bar and stir it in. Bake in preheated oven for 25 to 30 minutes–mine actually took closer to 45 minutes. In a small bowl, stir together the cocoa and butter. In another bowl whisk the eggs and sugar until pale yellow and frothy. Stir in the cocoa mixture and the oil. In a bowl, sift together the flour, baking powder, and salt. Stir the dry ingredients into the egg mixture until thoroughly combined. Stir in the coconut. Pour the batter into a buttered 8 inch square baking pan. Bake in the middle of the oven until the top is crusty and browned, about 25 minutes. Remove from the oven and cool on a rack in the pan. Cut into 2 inch squares. Yes I’ve made these once before! We had an event to attend tonight, and we were assigned desserts. I made these bars with the adjustments I suggested last time (making 1 1/2 the crust recipe) and baking in the 13 x 9 pan, and the bars were even better! The guests devoured these bars, and I will proudly say that my dessert was the only one that was eaten entirely! So do put these on your must try list. 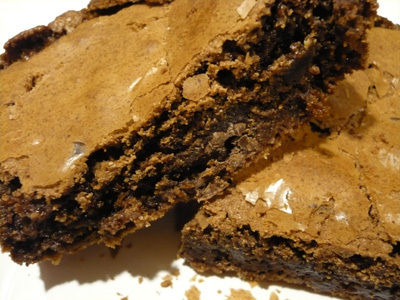 Beat first 3 ingredients at medium-low speed with an electric mixer until combined. Increase speed to medium, and beat until well blended and crumbly. Pat mixture into a lightly greased 13- x 9-inch pan. Bake at 350° for 13 to 15 minutes or until lightly browned. Beat cream cheese at medium speed with an electric mixer until creamy. Gradually add granulated sugar, beating until well blended. Add eggs, 1 at a time, beating at low speed just until blended after each addition. Add sour cream, vanilla, and 1 cup chocolate morsels, beating just until blended. Pour over baked crust. Bake at 350° for 25 minutes or until set. Cool completely on top of the stove. Microwave remaining chocolate morsels in a 2-cup glass measuring cup on HIGH 1 minute, stirring after 30 seconds. Stir until smooth. Cool slightly. Cut into bars and arrange on another plate. 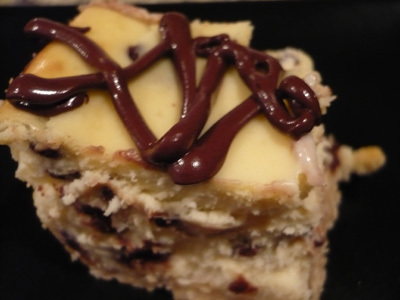 Drizzle over cheesecake: put the melted chocolate into a ziploc bag, cut a small amount of the bag off in one of the corners and then pipe the chocolate onto the bars. Cover and chill at least 4 hours. These cookies have many names, and there are many different versions, but the one thing they all have in common is peanut butter and Hershey Kisses. I have no idea the source of this recipe, but -s’s family makes them every year at Christmas time. They are scrumptious! Combine all ingredients. Blend well. Shape the dough into balls the size of whole walnuts. Roll balls in sugar and place on an ungreased baking sheet. 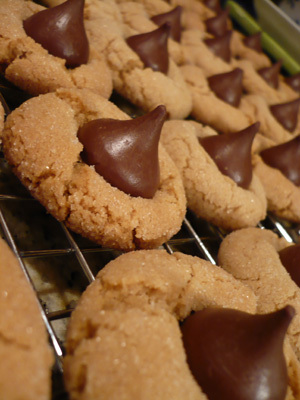 Remove cookies from oven, and while cookies are still on the baking sheet, press one Hershey Kiss into each cookie until the cookie begins to crack. 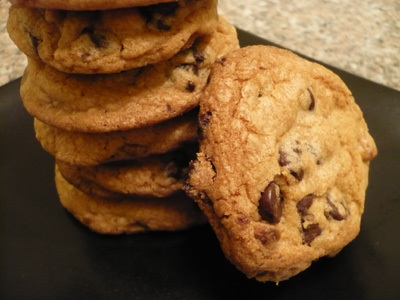 Remove cookies from baking sheet and allow them to cool on a wire rack. Brace yourselves. There are going to be quite a few dessert recipes in the next few days. -s has a couple of work functions where it’s been requested that he bring desserts. This recipe comes from the Southern Living, September 2006 issue. 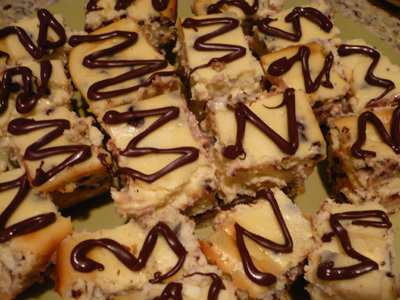 These cheesecake bars are EXCELLENT! There are a couple of things we did do differently and a couple we will do differently next time, and I’ll note those changes at the end. Bake at 350° for 25 minutes or until set. Cool completely on a wire rack. Microwave remaining chocolate morsels in a 2-cup glass measuring cup on HIGH 1 minute, stirring after 30 seconds. Stir until smooth. Cool slightly. Drizzle over cheesecake. Cover and chill at least 4 hours; cut into bars. To avoid cracking use the traditional water bath for the cheesecake. Simply place the pan in a larger pan filled about half way with water. We used a slightly smaller pan (our other 2 large pans were otherwise occupied) than the recipe calls for. The crust was the correct thickness, but the cheesecake was too thick for even cooking. So next time, we will use a bigger pan and make 1.5 of the crust recipe. I think one recipe of the crust in a bigger pan will make the crust too thin to hold up to the cheesecake. 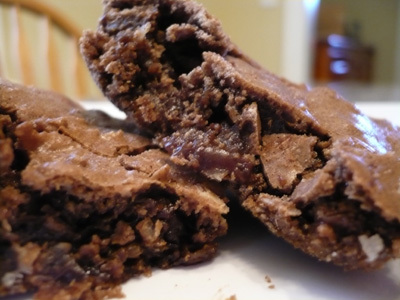 Cut the bars and then drizzle with chocolate. The best way to drizzle: put the melted chocolate into a ziploc bag, cut a small amount of the bag off in one of the corners and then pipe the chocolate onto the bars. 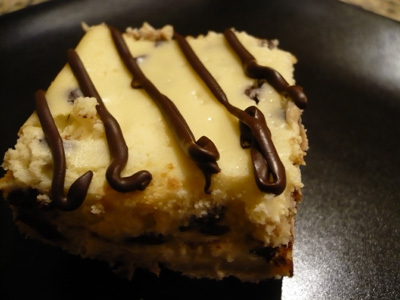 When we were living in Baton Rouge -s loved these bars, called Congo Bars, from CC’s Coffee House. 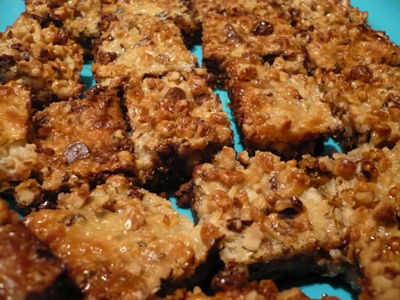 Recently I found this recipe from the Betty Crocker: Cookies, Bars and Cakes magazine (April 3, 2007) called Luscious Layer Bars, and I thought it sounded very much like those famed Congo Bars. Needing another dessert for -s’s office function, we gave it a try. I think they are super yummy, but -s isn’t too sure of them. We also made the Peanut Butter Chocolate Bars, and he admits though, anytime you put something up against peanut butter chocolate bars, the peanut butter chocolate bars will win hands down, except for cheesecake! Heat oven to 350F. Spray bottom only of a 13×9 inch pan with cooking spray. In a large bowl, stir cookie mix, butter and egg until soft dough forms. In bottom of pan, press dough using floured fingers. Bake 30-35 minutes or until light golden brown. Cool completely, about 2 hours. For bars, cut into 9 rows by 4 rows. Tip: instead of spraying the pan with cooking spray, line the pan with foil, then spray the foil and add ingredients…makes for easy cleanup and easy bar removal. I found this recipe here, and I thought it sounded pretty good. We gave it a try, and I liked it, but the entire crew didn’t love them. Considering -s doesn’t like much by the way of pumpkin, I discount his opinion on this recipe. Our 3 year old doesn’t like chocolate, at least in baked products (I know, shocking! ), and our 2 year old liked it, but I won’t make something that only 2 of us will eat—especially since I didn’t love them. But that’s not to say you won’t love them. Some people really like all things pumpkin-breads, muffins, pie etc. So, if you are a pumpkin lover, you’ll probably really enjoy these. Preheat oven to 400 degrees. 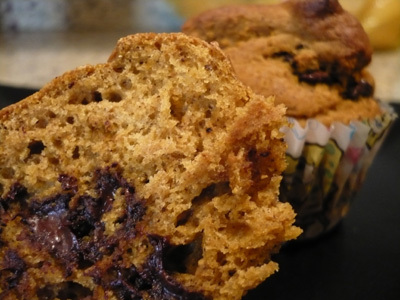 Grease and flour muffin pan or use paper liners and spray the liners with non stick spray. Mix sugar, applesauce, eggs. Add pumpkin and water. In separate bowl, mix together the flour, baking soda, baking powder, spices, and salt. Add wet mixture and stir in chocolate chips. Fill muffin cups 2/3 full with batter. Bake in preheated oven for 20 to 25 minutes. Makes 12 regular-sized muffins. This is a Betty Crocker recipe from one of those Betty Crocker magazines at the grocery checkout stand, but the recipe is also here. This bar is super rich, so a little goes a long way. I found, at least with our oven, that it took longer to cook, and I let it stand for the requisite 10 minutes, and then when I cut it it looked more like melted goo than cohesive bar. But that melted goo tasted yummy! Next time, I’d let it cool a bit longer if you want it to look more like a bar. Heat oven to 375F. In a large bowl, mix cookie mix and cracker crumbs. Stir in melted butter until soft dough forms. In ungreased 14×9 pan, press dough evenly. Bake 18-20 minutes or until set (it took mine closer to 25 minutes, and the cookie should looked evenly cooked). Immediately sprinkle chocolate chips over crust. Let stand 3 to 5 minutes or until chocolate begins to melt. Spread chocolate evenly over crust. Set oven to broil. Sprinkle marshmallows over melted chocolate. Broil with top 4 to 5 inches from heat for 20 to 30 seconds, or until marshmallows are toasted. (Watch closely; marshmallows will brown quickly. Cool 10 minutes. For bars, cur into 6 rows by 4 rows. Serve warm. Store tightly covered. To reheat the bars: put on a microwavable plate and microwave on high for about 15 seconds or until warm and chocolate is soft.